In the fall of 1906, Margaret Scott called a meeting of the Canadian Women’s Union (CWU) to present her concerns about care for the elderly. Since its founding in 1882, the CWU had overseen several different institutions providing housing and care to needy women and children. However, a number of other agencies in Winnipeg were then pursuing the same or similar lines of work. Scott’s speech about the lack of welfare services for the elderly in Winnipeg resonated with the Union. Before the end of the year, they converted their building on Lydia Street, then operating as a refuge for women, to establish Winnipeg’s first home for the elderly. The Middlechurch site, located just north of Winnipeg on the Red River, was purchased by the CWU in 1907 from the federal government, where they had operated an Indian residential school, until it was partly destroyed by fire. An undamaged three-story building, the former superintendent’s home, served initially as the residence for the Winnipeg Old Folks Home, as it was then known. In 1909, repairs to the larger school building converted it into the main residence. To be admitted, persons had to have both medical and housing needs. Through the 1920s, residents of the Home—furnished in 1915 with a 15-person hospital wing—numbered between 75 and 80; the opening of a new building in 1930 expanded living and working space for residents and staff. Donald D. McLean, who became the Home’s Superintendent in 1927, reportedly walked all the way from Winnipeg to Middlechurch when he heard about the job opening. 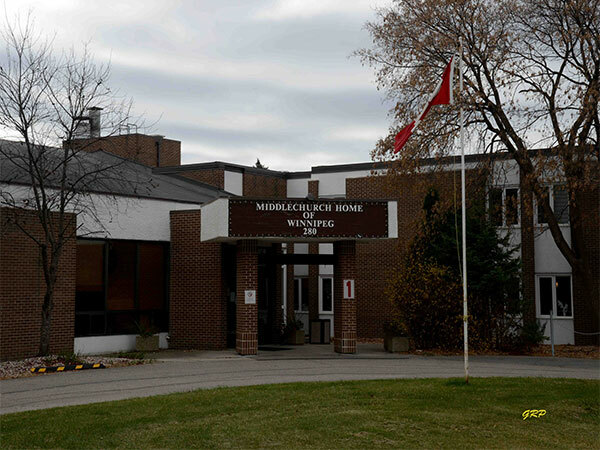 The organization, which is today known as Middlechurch Home and provides care to some 200 residents, was one of The Winnipeg Foundation’s first grant recipients. Our Heritage: The Middlechurch Home of Winnipeg, 1883-1995, Winnipeg: The Middlechurch Home of Winnipeg, 1996. This page was prepared by Conrad Sweatman, Gordon Goldsborough, and George Penner.